CLINAM · 2011, Meyre M.-E. et al. Nano Publications > Congress Abstracts > Miscellaneous > 2011 – CLINAM Abstract – Thermosensitive Magnetoliposomes for MRI-Guided Drug Delivery – Meyr et al. Contents: The development of new activatable drug nanocarriers, with multiple functionalities, presents a promising approach for cancer treatment. Improved drug delivery and controlled drug release at the tumor site may have considerable benefit by increasing treatment efficacy while reducing side effects and toxicity. Further, the possibility to monitor both nanocarrier accumulation and drug release via current clinical imaging techniques may be particularly relevant for an optimal treatment. 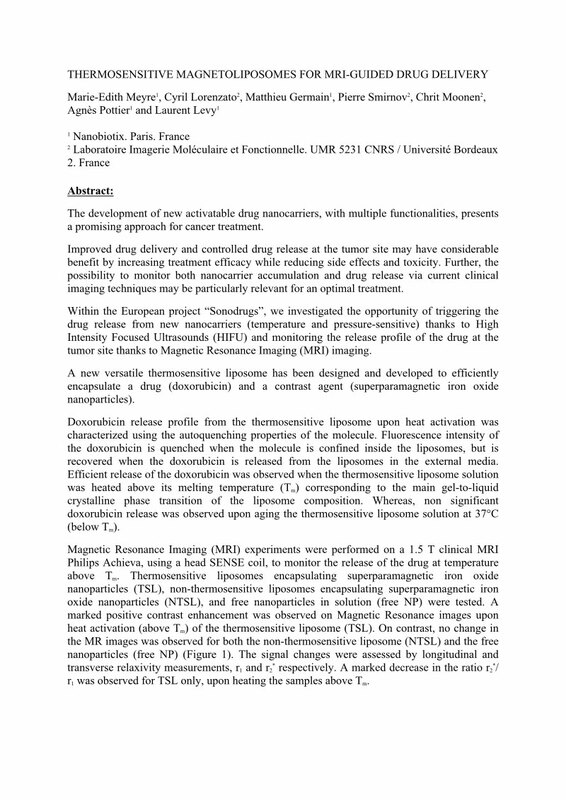 Within the European project “Sonodrugs”, we investigated the opportunity of triggering the drug release from new nanocarriers (temperature and pressure-sensitive) thanks to High Intensity Focused Ultrasounds (HIFU) and monitoring the release profile of the drug at the tumor site thanks to Magnetic Resonance Imaging (MRI) imaging. A new versatile thermosensitive liposome has been designed and developed to efficiently encapsulate a drug (doxorubicin) and a contrast agent (superparamagnetic iron oxide nanoparticles).